Here’s a line of child potty chairs made of solid wood. Notice that each potty chair comes with an attached toilet paper holder and book/magazine rack. 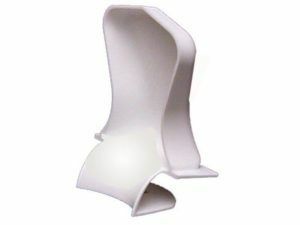 The potty chair squirt diverter is easily attached. And this is a helpful addition for little boys. Mission style potty chair made of solid Oak wood with lid. 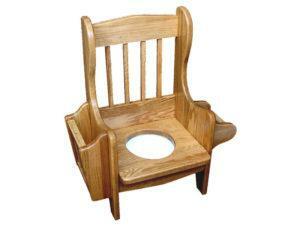 Solid hardwood potty chair featuring Mission style design. Squirt Divider for Potty Chair. 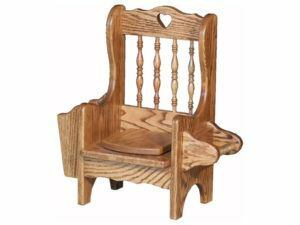 Solid hardwood Spindled back Potty Chair with Lid. 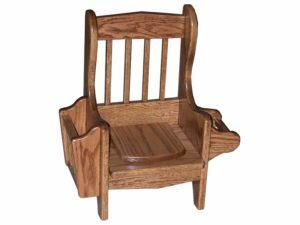 Solid hardwood Potty Chair with Spindled back, book/magazine rack and toliet paper roll holder. 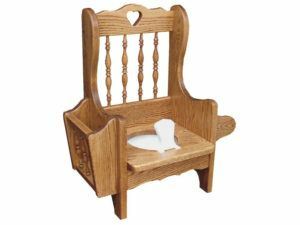 Child potty chairs from Brandenberry Amish Furniture are an absolute must for potty training your toddler. Amish artisans build each potty chair from solid hardwood. And this ensures durability and longevity. Also, you can choose a unit with or without a lid. Believe it or not, our potty chairs often get passed down to the next generation. So the unit you choose may well become a family heirloom. You can order a potty chair as shown. Or choose the one you like best. Then, tell us how you would like us to customize it for you.